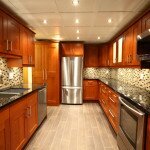 Granite countertops are a very popular choice for kitchens and bathrooms today. But when it comes to your home, is granite really the best choice for you? Here are some of the pros and cons of granite countertops that can help make your decision easier. Granite is a beautiful choice for countertops. Its natural, unique look enhances any room and adds style and personality. Because granite is such a high-quality material, installing it in your home will only add value to it. Granite also is incredibly durable—it can literally last forever if properly cared for. It is a great cooking surface for kitchens. Granite countertops will not break or crack when a hot pan is set on them. They are also easy to clean with water and mild soap, which limits the bacteria that can grow on the countertops. This keeps them more sanitary than other types of countertops. Granite will last forever, which is great if you love the color and style. But if you want a change, the whole countertop must be changed. Granite is very expensive, and beside the cost of the material alone, it is also expensive to have it installed. Clearly, there are good and bad sides to granite countertops, as there are with any material you want to put in your home. The decision depends on your personal style and tastes. If granite is not for you, we have many other options for countertops that will fit your needs. No matter what you decide, Jim’s Floor Depot has the materials you need to get the countertops you love!